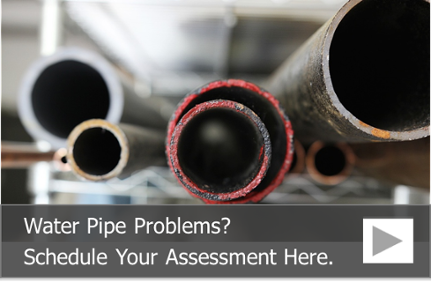 When it comes to custom pipe lining project, our professional pipe lining technicians can develop the right solution for you, even if your plumbing pipe problems reside underground. Here at NuFlow of Chicago, we recently completed a custom lining project at Guaranteed Rate Field, formerly known as US Cellular Field and home of the White Sox. Pipe corrosion at large facilities, like stadiums, theaters, food courts and other large public venues, especially those that serve beer and soda, can pose major problems. These public venues pour thousands of gallons of soda, beer and grease down their drain lines. Soda and beer are acidic, and over time, that acidity can eat through the plumbing pipes, causing pits, cracks and collapsed pipes. The grease that is poured down the drains congeals as it cools, reducing the pipe’s internal diameter until the pipe is completely clogged. When these factors are combined, it can lead to plumbing pipe backups, slow drains and expensive repairs. Our pipe lining technicians have been working with Guaranteed Rate Field over the last several months to solve some of their toughest drain line problems. Most recently, they contacted us about their severely corroded trash compactor drain lines and floor drains. Specifically, they needed three trash compactor drain lines cleaned and lined, and they needed 38 floor drains cleaned and lined. The biggest drain line problem was located on the first base line. The drain line contained a completely disintegrated WYE fitting. WYE or “Y” fittings connect drain lines to sewer laterals. The sewer laterals then drain the waste into the city’s sewer system where it is transported to the water treatment facility. The disintegrated fitting posed a challenge because it was located underground. Normally underground fittings are cut out and replaced with new fittings. In this instance, cutting out the fitting would have resulted in a time-consuming repair process that involved digging down to the disintegrated WYE fitting, cutting it out and replacing it with a brand new fitting. The traditional pipe repair process would have damaged their field and resulted in time-consuming repairs to the grounds. 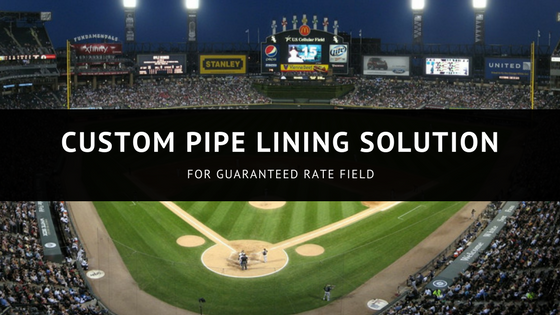 Guaranteed Rate Field wanted to avoid the expense and time involved in performing a traditional pipe repair, so they contacted our professional pipe lining experts for a consultation and custom trenchless solution. Under normal circumstances, pipe liners are not used to restore pipes that have active branches, like WYE fittings because the pipe liner completely seals the connection, rendering the branch line useless. We took the challenge home to our headquarters to come up with a solution to line the pipes and recreate the WYE fitting. After several attempts, we finally came up with a solution that would line the pipes and recreate the fitting. We opted to use multiple liners on the pipes and special cutting tools that would allow us to recreate the fitting. The result was a clean, debris-free drain line and a completely recreated WYE fitting that would function for years into the future without the need to dig large holes in the stadium. To learn how we can help you extend the useful life of your plumbing pipes and drain lines, call us at 815-790-9000. We can even design a custom solution for your toughest drain line problems.